I am a custom woodworker located in Toms River, NJ. I specialize in detailed reproductions of antique sewing furniture, including thread spool caddies (also known as cotton reel stands or holders), spool cabinets, and sewing stands. I also specialize in furniture grade quilt racks and custom wall mounted quilt hangers in a variety of hardwoods and design styles, all designed to be compatible with formal furniture. ALL OF THE ITEMS THAT I OFFER FOR SALE ARE HAND MADE BY ME HERE IN NEW JERSEY. I personally make all of the items pictured. I work alone and devote as much time as necessary to each individual piece to achieve the highest quality result. All customers are given the opportunity to choose the wood type, stain if any, and dimensions and configuration of their item. A note on the woods that I use: All pieces begin with rough sawn boards of the highest quality north American hardwoods such as cherry, walnut, red oak, quarter sawn white oak, birds eye maple, and curly (tiger) maple, mostly from eastern Pennsylvania, and select tropical hardwoods. Since wood is a natural material, each board will be somewhat unique in grain and color. I strive to closely match the boards for each item in order to achieve a uniform appearance unless a contrast is called for. Each unstained wood will age in its own way; walnut will become lighter, while cherry will darken significantly and maple very little. 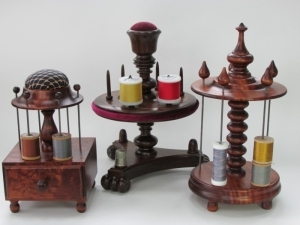 Items made of cherry with a clear finish will appear light initially, but will quickly start to darken and take on a rich, mellow color that can only be achieved with age. There is a noticeable difference in less than six months. Initial color contrasts within a cherry piece will even out with the aging of the wood. Color change in stained pieces is minimal over time. I USE ONLY SOLID HARDWOODS (NO PARTICLEBOARD, MDF OR VENEERS). I use hand-applied stains and dyes that allow the grain of the wood to show and I apply four coats of hand rubbed satin varnish to each piece. This provides protection for the wood and fabrics that contact the item, and the low luster enhances the appearance of the wood grain. 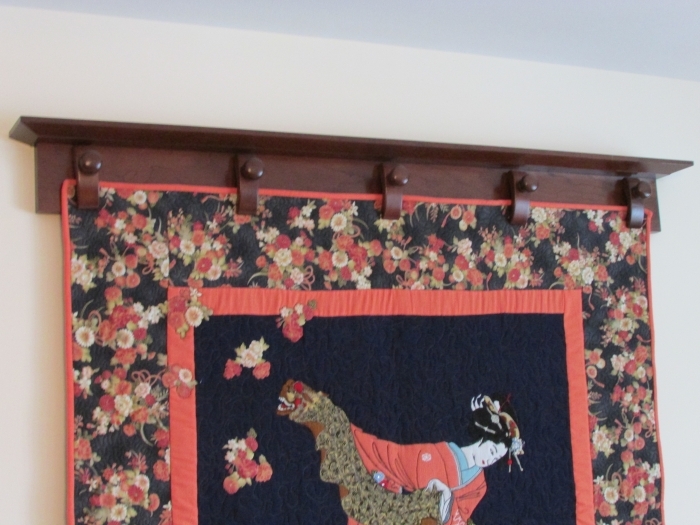 All of the pieces I make, including the quilt racks and wall quilt hangers, are intended to be appropriate for placement in a sewing room, living room, family room, or bedroom alongside fine furniture. NOTE: If you contact me by e-mail you should add my e-mail address to your contacts to ensure that my response does not end up in your spam folder.